April is a hopeful time of the year. Soon the city of Savannah will be beaming in a sea of pink, with a host of blushing azaleas in bloom and a flurry of ribbons for the upcoming Susan G. Komen Race for the Cure. Each year, the race takes on a meaning that is unique for everyone who experiences it, but for survivor Pat Straw, in many ways, it represents a commitment to health that she has had in her life for many years. There are many words that could be used to describe Pat, but one that comes quickly to mind is active. 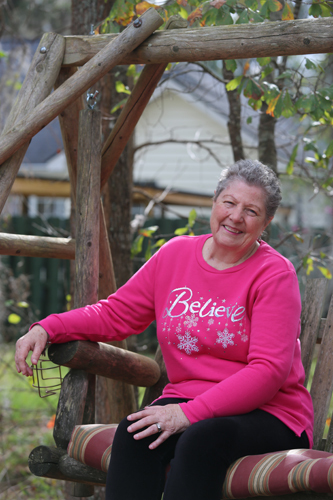 Both before her diagnosis with breast cancer and since, Pat’s life has been filled with a variety of different ways to have fun and stay in shape. “I was a health 69- year-old enjoying golf, (I) played as much as I could. I (participated in) the YMCA water aerobics for two hours, three times a week. I love gardening, entertaining, just love the outdoors in general. When I wasn’t playing golf, I went to the gym or I played tennis…” Living an active lifestyle is important to overall health, but Pat would learn that it cannot prevent every type of health condition.